Born in Gauting, Bavaria, Nick Eggenhofer became a painter of the romance of the American West with its cowboys and Indians. He has a reputation for historical accuracy from careful research and also as an authority about frontier western transportation. He was first exposed to the lore of the American West by hearing about Buffalo Bill’s Wild West Show in Germany from older relatives who had seen performances. American western movies continued to stir the interest. In 1913, at the age of sixteen, he came to America with his family from Germany, and three years later he enrolled in night art classes at Cooper Union in New York, something he did for four years. During the day he studied lithography at the American Lithography Company, a place that trained many successful artists. He established an illustration studio in New Jersey and made a living as a commercial artist, illustrating hundreds of western magazines and books between the 1920s and 1940s. He became a collector of western artifacts including saddles, guns, and Indian paraphernalia. 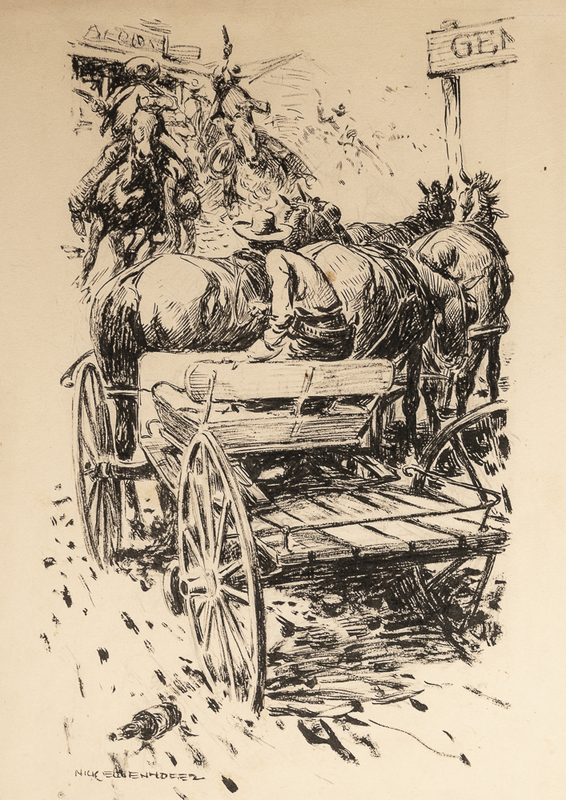 He also wrote and illustrated his own book titled “Wagons, Mules, and Men: How the Frontier Moved West,” a detailed, comprehensive volume on pack animals, wagons, carts and stagecoaches used to transport people on the western frontier. For the Whitney Gallery of Western Art in Cody, Wyoming, he made a series of ten scale models of Conestoga Wagons. In the 1960s, he moved from his home in West Milford, New Jersey and settled in Cody, Wyoming, the town named for Buffalo Bill Cody, the man who first aroused his interest in western life.